Only 5 left! 5 items in stock. 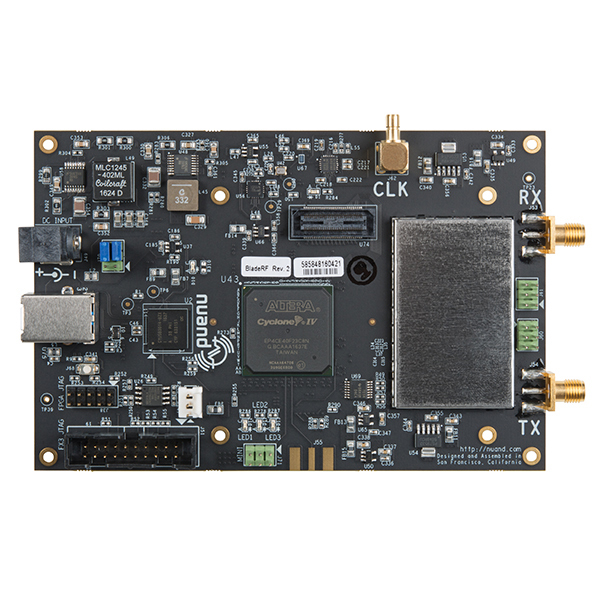 The bladeRF x40 is an affordable USB 3.0 Software-Defined Radio (SDR) designed to allow students and RF enthusiasts to explore wireless communication, and to provide professionals with a versatile COTS waveform development platform. 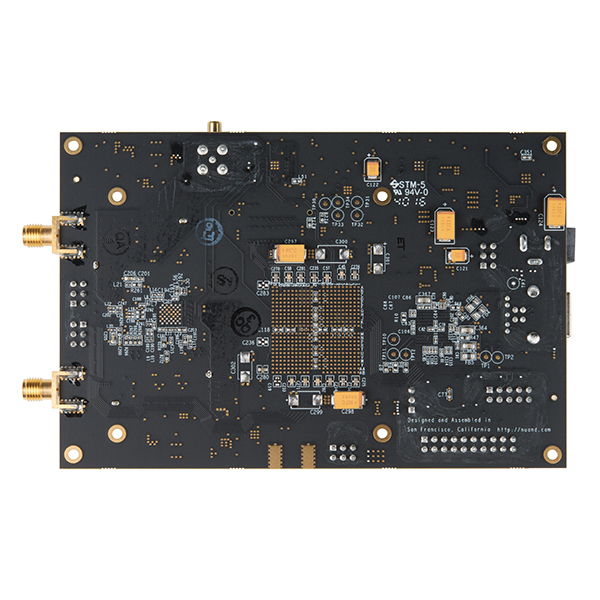 The bladeRF x40 is a great next step after using an SDR like the HackRF One, especially with the built-in FPGA providing you with more user-defined options. 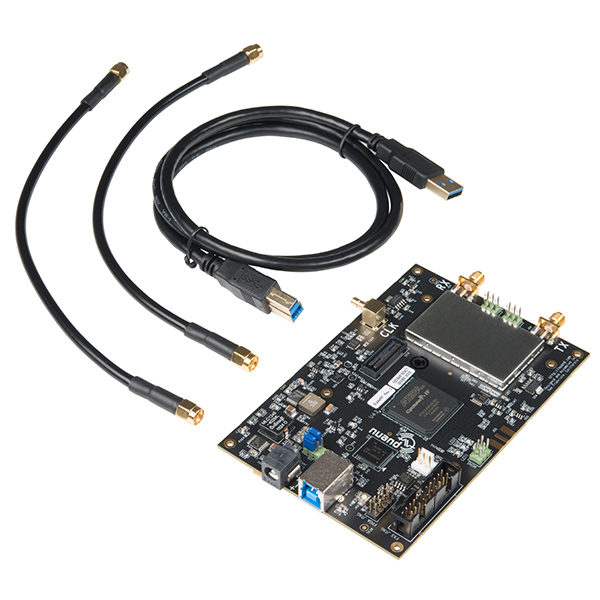 Out of the box, the bladeRF can tune from 300MHz to 3.8GHz without the need for extra boards. Through open source software such as GNURadio (live image), the bladeRF can be placed into immediate use. 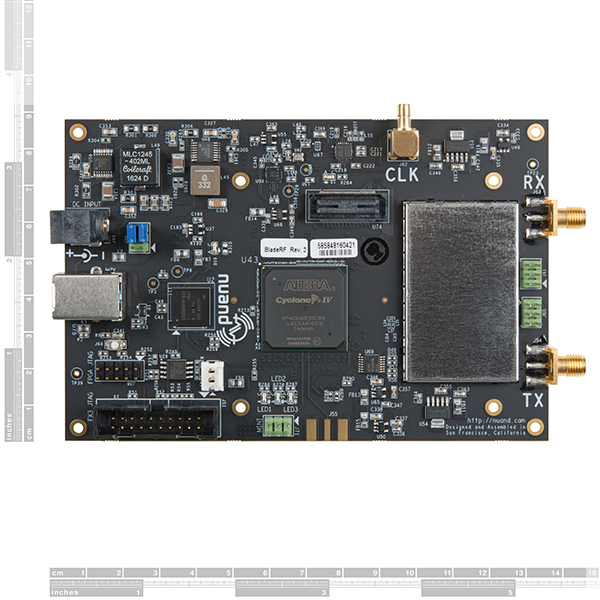 With its flexible hardware and software, the bladeRF can be configured to operate as a custom RF modem, a GSM and LTE picocell, a GPS receiver, an ATSC transmitter or a combination Bluetooth/WiFi client, without the need for any expansion cards. Skill Level: Experienced - You will require a firm understanding of programming, the programming toolchain, and may have to make decisions on programming software or language. You may need to decipher a proprietary or specialized communication protocol. A logic analyzer might be necessary. The 300Mhz cut-off kinda kills most SDR non-sat communication projects except 70cm applications. Need at least down to 100Mhz for AIS and 2M projects and down to 500khz would open up all the HF bands! Look forward to seeing a future product. Looks like fun. Too bad it bottoms out at 300 MHz. I'd actually be interested in one that worked between 500 KHz and 1.3 MHz without external boards or mods. Is that in the works? The real story is this product is LIT!!!! After watching the video and looking at the description, I realize I have no idea what any of these terms are or what this hobby involves. Does sparkfun have a primer on this sort of thing (not even sure what it's called)? A bit late, but a quick summary. SDR is software defined radio. Basically the device lets you receive and transmit on a large range of frequencies, but that is configured in software instead of hardware. Well, now you are wondering who wants to receive and transmit on a lot of frequencies? Welcome to the world of ham radio. While we do have some people in the building that have their ham radio license we don't have much in terms of tutorials on it. Check out your local Ham Radio club or ARRL if you are interested in more information. PSA: If you want to transmit anything you will want to get a ham radio license. The varying levels of license give you the ability to transmit on different frequencies. Does anyone know of a good enclosure for these? Thanks, but it's an external add-on (like the iphone dongles), it's an additional $200 and it's out of stock. Still looking for a version that covers 500 KHz to 1.3 GHz with no add-ons needed. Should be simple for them to design/build one - it's only half the bandwidth and it's down at the easy end of the spectrum. You beat me to it. $620 for an SDR from 60 kHz to 3.8 GHz sounds like a pretty good deal! The online information is a bit sparse and many people seem to be using this with gnuradio which seems to be more of a CB or walkie-talkie kind of thing. I'm interested more in digitial communication. That's when I stumbled on the bladeRF-fsk example that is only on the github version of the software. It's a simple example that alllows for bidirectional transfer of files. The example builds from the FSK modulation code all the way up to the application layer demonstrating how easy and flexible the device is. If your interested in digital communication, be sure to check out that example. Also, sparkfun has 2 version of the telescoping antenna. One for 75MHz to 1 GHz and one for 300 MHz to 1.1 GHz. I accidentally bought the lower frequency version which works, but the other version would have been better. i can not get work like i read in the articles "https://blog.strcpy.info/2016/04/21/building-a-portable-gsm-bts-using-bladerf-raspberry-and-yatebts-the-definitive-guide/",and the sdrsharp with windows "BladeRF + SDR# on Windows 10"please help me to understand i am newbie on that device,thanks,sorry for my english,if youvae some info on spanish woulbe cool. Every software/hardware engineer must have this device. You can listen and simulate bluetooth, gsm, wifi and other radio devices. It's like Oscilloscope, but for Radio. So far so good testing this out for a few different projects I'm playing with. As a licensed ham radio operator, this area has always interested me. And this device is a perfect companion for voice/data transmission scenarios. Not to mention there are a fair amount of open source projects out there that interface with the bladeRF device. Product arrived quickly and as expected. I'd recommend this product to others as well!